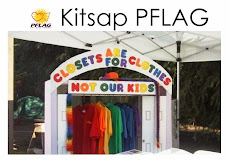 We are moving the location of our monthly PFLAG meeting starting *this* Monday, August 18th at 6:30 p.m., to Family of God Lutheran Church at the corner of Central Valley Road and Fairgrounds Road in East Bremerton. The meeting will continue to be every 3rd Monday of the month at this new location. We are excited about this new space since it is a lot more comfortable, more centrally located, and gives us the ability to show movies and other presentations. Please let us know if you have any questions.